Samuel Vera, has been illustrating since he was a child and decided to create his own comics at the age of 13 when he was challenged to stop drawing other peoples characters and create his own. In 1992 he decided he wanted to run his own comic book company. That’s when the idea for Crazee Comics spawned and the brand logo was created. In 1998 he hooked up with several writers and artists to collaborate on comic books. Although they worked on several projects, it was not until 2003 when Samuel Vera launched Crazee Comics officially and entered the world of Comic Book Conventions. 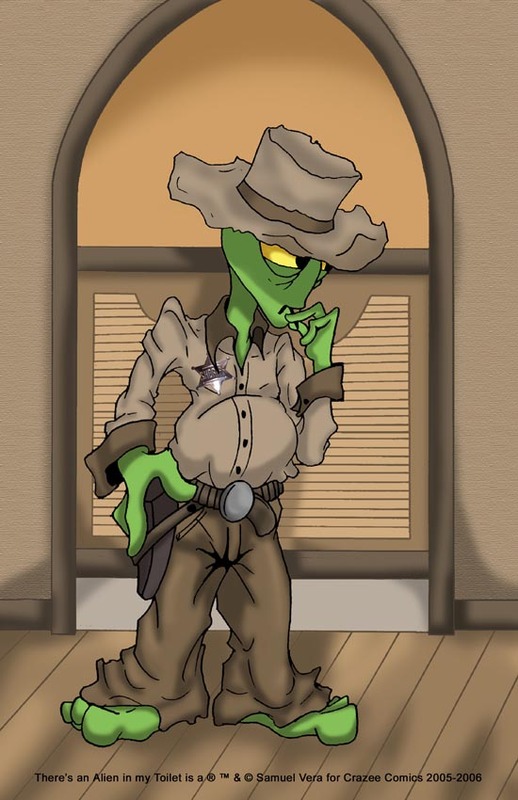 Over the years, Samuel Vera made many friends and published several titles but it was not until the release of There’s an Alien in my Toilet when the world began to take notice. There’s an Alien in my Toilet has received critically acclaim and has launch a PR tour putting Samuel in the Media from Television to radio and print. S: Wow! I was a big Star Wars and GI Joe fan. I played with action figures all the time and loved to play man hunt with my friends in the park. Loved out door activities like bike riding, baseball, swimming, dodge ball, football, just about anything in a group setting. Cartoons were a lifeline for me. Loved Saturday morning cartoons. S: Yes. My brother was influential and his illustration of three monkeys in a barrel sparked the illustrator in me. S: Peanuts, Traditional Hanna Barbara, Ralph Bakshi, Charles Schultz were big influences on my style. I was inspired by the original Hobbit animations, Fire and Ice, and the last Unicorn. S: I wanted to control my destiny and I am very protective of the characters I create and the direction they take. Almost like a parent and his child. I love to see the start and finish process from fleshing out the characters history, timeline, design and role in the story. That’s the best part of the development stage for me. S: I believe creativity has no boundaries. So if that’s an impact on my creativity then that’s cool. Dream big, create big and explore. That’s what I live by. S: Yes. I went to a traditional High School with basic art class where you would draw a flower pot, etc. I felt like a half empty cup of water. I knew I had opportunities with perspective, Lighting, and foreshortening. I eventually took several classes at SVA (School of Visual Arts) to fix this problem. Money well spent. Since then, I attended Gibbs for web design and animation which allowed my creativity to grow and tap into other mediums to promote my work. S: I prefer pencils and computer. I recently invested in a tablet to speed up my process and reduce the amount of paper I use to sketch with. I truly helped my process ten fold. I paint occasionally and mostly for commission pieces I sell. S: Books I am known for are Cosmic Wars, Forbidden and most noted for the critically acclaimed sci-fi comic book series for all ages THERE’S AN ALIEN IN MY TOILET. I also have a line of kids’ books which I am currently shopping to agents and publishers to represent and publish for me. S: I did some freelance work for some tech companies and networks which required me to be in a room with several executives. They would brainstorm and throw ideas at me and I would be there with a large pad fleshing out the concepts. Once approved, I would race home and work on the concept all night, race it to the corporate office at 8:00 AM to be presented to their board of directors. High intensity, exciting and stressful at the same time. But man, some of my best work would come from those projects. S: I am a freelance web designer, I run a podcast show called Catch Da Craze, I am also writing a pilot script for There’s An Alien in My Toilet. I also have a full time job as a Group Manager in the retail sector which can impact on my time to get material done on time. S: I am a prime example of Color in Comics. I believe ethnic creators need more outlets to expose their works to the world. When I look at who are the top players in comics in Wizard’s top ten, seldom do you see a person of color. We are the majority with few means of exposure. There are so many talented people out there and the Color of Comics represents some of those people and is something I will always advocate. Q: Since exhibiting the depiction of people of color is an aim of the COC, what part does cultural and/or racial diversity play in your art, and your art assignments? S: Well, my work is extremely diverse. In Forbidden you have several races represented, Hispanic, Black, Asian and more. In Mandie Pandie, the main character is Hispanic. In There’s An Alien in My Toilet, again many races represented. And in my sci-fi books there are many races from many worlds which as I dig deep may be a subconscious way for me to keep things in perspective. There is no one right or wrong way. There is no up without down so we need other opinions, colors, experiences to keep the universe moving forward. That’s probably why I like an Everything bagel with cream cheese and jelly so much. It plays with your palate and is an explosion of many flavors coming together for one exciting experience. S: I want to establish a career in the lines of Charles Schultz. Build a brand generations will know and love and share with friends. S: If you are going to do this, go 100% into it. If you have limits, establish that in the beginning. There is a lot of work and commitment involved, so create an agenda, organize your time to determine when you can work on your craft, whether its in the evening or in the morning. Surround yourself with creative people in various fields, and you’d be surprised what influences you. Commit to you craft and don’t make excuses. If you find yourself saying, “Oh, I will get to that tomorrow or the next day, that’s a tell tale sign and a red flag. Draw, draw, draw is the best advise. Always have the tools to create with on you. A pen, pencil and pad. And have fun. S: Yes. Dreams will remain dreams if you don’t unlock your imagination to explore. How did Disney begin? Wake up and create… your Disney awaits!